Do you know anyone who feels anxiety, or depression, is resistant to last minute changes in plans, or doesn’t seem to bond well with other people? It could be that their time in the womb created a biological blueprint that caused them to be that way. 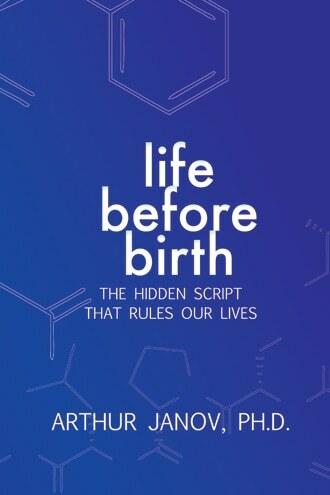 At least, that’s the argument, as I understand it, that Dr. Arthur Janov outlines in his new book Life Before Birth. Janov is the well-known psychologist and author of 11 books including the bestseller Primal Scream. Yup, this is the guy who advises on the importance of letting out a rip-roaring, gut-wrenching scream in order to clear certain health issues. Needless to say, he’s got a bit of a reputation. But when the book arrived for my review I dropped my own judgements of The Scream and opened it up with a consciously clear mind. Because study after study is proving that we are deeply effected by our time in the womb and the birth process–and Dr. Janov is positing that simply re-living or re-feeling traumatic experiences from this time can free us from their negative impact. And I’m kinda big on freedom. Liberty. Libre. – Typical talk-based therapy interacts with and attempts to address issues via the language- and logic-based area of our brain–the neocortex. But if people are suffering from challenges that arose as a result of what they experienced in the womb, talking won’t help. Janov argues traumatic intrauterine memory–memory that is formed in the uterus and causes physiologic pain or emotional pain–is imprinted in the brainstem and the limbic system. The brainstem and limbic system aren’t guided by language and logic. They’re guided by reflexes and feelings. Bonus: Faster-acting results happen through a holistic, body- and feeling-oriented approach. – And check this out: there is “new evidence from researchers at the University of Pennsylvania and Princeton that ‘as you search for memories your brain progressively comes to resemble the state it was in when you initially experienced the event.’ In other words, the more fully an event is remembered, the deeper and more lasting impression it will leave on the brain.” So rehashing a memory embeds it even further. Bonus: we can use this to our advantage–re-remembering over and over again a particularly calming and soothing memory to help create a calmed and soothed system. – Think only our brain cells record memory and dictate who we are? Janov argues that “Our human imprint…is found in every fiber and cell of our being and retains a precise memory of its past. It cannot be pinpointed to any particular location in the system since it is everywhere, from our hormonal balance to our neurology. And because the imprint is everywhere, when we relive it there may be changes throughout the system. That is why we need to relive past experiences: to reset the set-points, and in so doing, exercise a profoundly new approach to medicine and psychiatry.” Bonus: Simple mind-body practices, like yoga, can have a powerful freeing effect. If we feel a particular emotional response arising while positioned in a certain way, we can mindfully sit with it until is passes through us. I have personally experienced the liberating effects of paying particular attention to an area of my body that seems to be constricted or hold tension–via a stretch or massage–and then expressing whatever emotion comes up. – What can our moms do? “From a neurologic perspective, a mother’s love and calm while carrying not only strengthens the baby’s brain but also produces better painkiller receptors, known as opiates, that allow the baby to manage pain more easily.” “If a pregnant mother drinks a cocktail, the baby will be exposed to the toxic effects of alcohol; if she smokes or inhales secondhand smoke, the baby’s respiratory system will be effected; if she is depressed for a lengthy period of time, her baby may be imprinted in ‘down mode,’ showing lower vital signs. If she is anxious—with high blood pressure and a consistent hear rate above 90 beats per minute–the baby may be fixed in “up” mode. The main point: a carrying mother shapes her fetus. Bonus: Knowing this enables us to help babies be born calm, healthy, happy and strong. – Ever hear of telomeres? Telomeres are a region of repetitive DNA which cap the chromosomes and keep the DNA of the cell stable. When telomeres are longer, we live longer. Teleromes are correlated with the stress hormone cortisol and tend to get shorter as cortisol increases. Primal therapy has been proven to reduce cortisol, maybe slowing teleromes shrinkage and prolonging life. Bonus: Other stress-reducing activities–mindfulness, yoga, exercise, or simply hanging out with people we feel relaxed around–could potentially have the same longevity-inducing effect. And here’s what was challenging about Life Before Birth. Jargon-heavy and psychology-oriented, it’s a bit of a laborious read. But if you want to get the scientific goods on how to create healthier babies, or why it’s important to clear ourselves of repressed non-verbal memories, it’s worth the effort. Check out the online documentary–via BBC–The Biology of Dads. A fascinating exploration of what impact babies have on dad’s biology and vice versa, there’s an interesting bit in there on how babies react to their Dads–while still in the womb.